Tinkering is a way of learning through hands-on activity -- experimenting with materials and devices to see how they work, taking things apart, making small changes and improvements, exploring and inventing. Tinkering may seem like a form of play -- and it is -- but it is also a powerful way of discovering truths about science, engineering, and math. 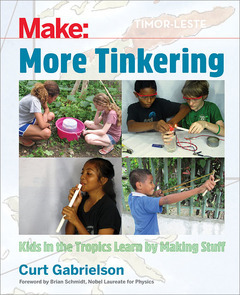 With this book, Curt Gabrielson follows up on his best-seller Tinkering: Kids Learn by Making Stuff with this all-new volume that features more than three dozen fun and educational tinkering projects based on his years of working with kids in the tropical island nation of Timor-Leste. Step-by-step instructions accompanied by full-color photos take you through a range of enjoyable projects that explore life sciences, physics, chemistry, earth sciences, and mathematics. You'll discover how math is used to make baskets, how fungi create fermentation, how electricity can make a magnet, how the greenhouse effect creates warming, and much more. The author also enlivens his latest batch of tinkering projects with colorful tales of his experiences in the tropic and the lives of the people he' s met there. This book is perfect for parents, teachers, and students with an interest in hands-on, tinkering-based science and mathematics education, whether in traditional schools or in home-schooling situations. It will also be of interest to anyone who wants to learn more about developing nations, the culture and unique history of Timor-Leste, tropical nations or Asian cultures, with specific links to Indonesia, Portugal, or Australia.